Interested in selling Cling Cloth in your retail establishment? Beeswax food wraps are right at home in cheesemongers, kitchen and gift shops, and all-natural grocery shops. We’d love to work with you to help people keep their food fresher while using less single-use plastic. Read on to find out about our wholesale and bulk pricing. 10+ units receive 20% discount wholesale pricing with code BULK20. 20+ units receive 30% discount wholesale pricing with code BULK30. 30+ units receive 40% discount wholesale pricing with code BULK40. Bulk purchases will be dispatched within 6-10 days. For much bigger volumes please contact us to discuss if we can offer a further reduction in price. We have also worked with charity and private organisations to offer our beeswax food wraps unpackaged for a variety of purposes. We also offer a white label option, so if you want to see your logo and branding on our beeswax food wraps, let us know! White labelling options require a longer lead time due to fabric printing. 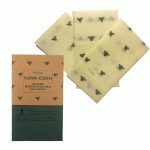 Read more about our Cling Cloth beeswax food wraps and our FAQ. If you have an other questions about our wholesale and bulk pricing, please use the form below to get in touch. If you would like further information or have us list your shop in our growing list of stockists, please get in touch with your details and we will be in touch very shortly!